Sleep apnoea (SA) is associated with a range of conditions, such as hypertension, coronary artery disease, arrhythmias and diabetes, to name a few. And now researchers have explored the link between SA and heart failure (HF), with interesting results. In this study, Danish nationwide databases were used to follow 4.9 million people from 2000 to 2012. Of these, 45,485 individuals developed SA, 45.2 percent of whom received CPAP therapy. The end points were HF, defined as first-time primary or secondary diagnosis at hospitalisation or during outpatient visits. Notably, those receiving CPAP therapy were older (median age of 55.7 years) than patients with SA without CPAP (52.4 years), and those in the background population (43.1 years). Furthermore, patients receiving CPAP therapy had a higher rate of comorbidities and concomitant pharmacotherapy than the other groups. The incidences of HF in patients with untreated SA were significantly higher than those in patients with SA receiving CPAP therapy. Furthermore, patients aged over 60 years who received CPAP had a lower risk of HF than those with SA who were not receiving CPAP. These findings are significant. Patients with SA who are not treated with CPAP are at an increased risk of developing HF; and patients over 60 years who are receiving CPAP have a lower risk of HF compared to the other groups. It is interesting that sleep apnea patients above 65 years of age might have an increased risk of developing heart failure and that treating these patients with CPAP therapy could possibly eliminate that increased risk. Even though the study design is observational and we should be careful concluding on causality, these findings generate a strong hypothesis which should be investigated further. The US preventive service task force issued a recommendation in 2017 not to screen for OSA due to insufficient evidence on benefits and harms of a screening program and, especially, due to the lack of evidence concerning the potential beneficial effect of CPAP therapy on hard outcomes. 1 We believe that this study adds important data to this discussion and should encourage more studies focusing on the possible cardiovascular risks of sleep apnea, as well as establishing CPAP therapy’s effect on cardiovascular outcomes. 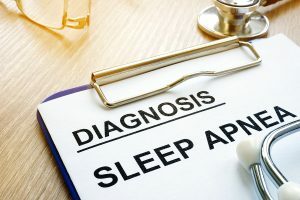 Sleep apnea is a very underdiagnosed condition, and the increasing evidence of associated risks and the potential beneficial effects of CPAP therapy should encourage both patients and clinicians to focus on diagnosing and treating sleep apnea. Bibbins-Domingo K, Grossman DC, Curry SJ, Davidson KW, Epling JW, García FAR, Herzstein J, Kemper AR, Krist AH, Kurth AE, Landefeld CS, Mangione CM, Phillips WR, Phipps MG, Pignone MP, Silverstein M, Tseng C-W. Screening for Obstructive Sleep Apnea in Adults. JAMA. 2017;317:407. Cowie M, Woehrle H, Wegscheider K, Angermann C, D’Ortho M, Erdmann E, Levy P, Simonds A, Somers V, Zannad F, Teschler H. Adaptive Servo-Ventilation for Central Sleep Apnea in Systolic Heart Failure. N Engl J Med. 2015;373:1095–1105.